Our sweet angel, Mason sported his creepy side Halloween night as "Chucky" the evil doll in horror movies such as "Child's Play 1, 2 and 3", "Bride of Chucky", "Seed of Chucky", "Curse of Chucky", and "Cult of Chucky". Mason also had a perfect attitude Halloween night giving people "the look" and not smiling. He was blessed with an awesome theatrical personality! We spent Halloween night at Alayna Ertl's birthday party/Halloween party/benefit held in Watkins, MN. Alayna Ertl is a 5 year old girl from Watkins, MN who was kidnapped, raped, and murdered by a friend of Alayna's father. The event was an amazing, joyous, festive event celebrating not only Halloween but also Alayna's birthday which is on Halloween. After the festivities at Alayna's party we trick or treated at a few houses near our home. Mason was a "hit" at the celebration with people commenting on how great his costume was and how he was still adorable as Chucky the evil doll. Random people were asking to take pictures of Mason, which made me pretty proud of the work I put into making his costume perefect!! Process of making the costume perfect: I sewed fabric on the bottom of regular jean bib overalls, then used fabric paint to design the overalls to look like Chuckys, including the phrase "Good Guys" on the front pocket and "friends til the end....." on the back pocket. I bought a striped shirt to put underneath, shoes that I smudge painted red to resemble blood and orange hair spray color. I finished him off with a gruesome tattoo which took a few times to apply as he didn't appreciate me putting something on his head like that. With long planned dedication to his costume, I chose not to give Mason a haircut since early September so it could be as long as possible by Halloween. Then on Halloween I gave him Chucky's signature comb over hair style. The cost of his costume was a thrifty $20. 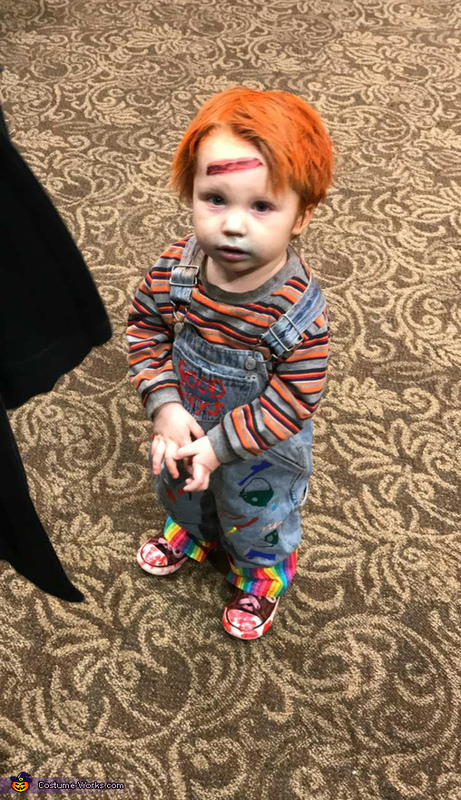 The thought of dressing Mason up as Chucky for Halloween came from my sister in law and one of her friends. Ever since Mason was 6 months old we all saw a resemblance in him to the evil doll Chucky. His red hair and teeth spaced the way they are complete his personal appearance emphasizing his "Chucky" look. Mason is 23 months old (will be 2 years old on December 7). Although Mason was born after a full term pregnancy he was inflicted with complications from a difficult delivery. He spent the first month of his life in the NICU at St. Cloud Hospital in St. Cloud, MN, thriving with a feeding tube and oxygen. After a month of being 75% sedated and rehabilitated in the NICU Mason was strong enough to come home. Mason has been delayed in his development, but with our hard work as a family he gets stronger every day, physically and emotionally. He currently struggles with asthma (persistent, severe wheezing because the doctor can't diagnose asthma at such a young age), an allergy to peanuts, eczema, and severe gastric reflux. Even though he comprehends language he is unable to verbalize it. Mason is only able to say "daaaaa...." and the rest is jibberish. With the assistance of speech therapy and consistent work at home, Mason is progressing slowly. Mason also develops respiratory infections which worsens rapidly with his impaired lungs. When Mason was 4 1/2 months old he spent 2 days in the hospital diagnosed with RSV. Two months later, at 6 1/2 months he developed another respiratory infection which worsened rapidly within 6 hours. When we rushed him into the emergency room at 7 am he was lethargic and turning white/grey/blue. His oxygen saturation was at 37% we made it there with minutes to spare. Mason miraculously recovered and only spent 3 days in the hospital. The doctors were impressed with his strength! We are so proud of our Mason. He is such a joy to our lives and fits in perfectly with his two older brothers Keanan, 10 years old and Dawson, 5 years old. Every day is a celebration with Mason, so we wanted to ensure his Halloween was above and beyond the normal celebration of daily life!